Downsizing – a sometimes difficult balancing act. Downsizing, for whatever reasons you are considering it, is often a difficult thing to manage. Whilst it is often easy, at a logical level, to decide that your current home is rather bigger than you now need or can afford, at an emotional level it is often difficult to let go of your old home, and even more difficult to find a new home that fits the bill perfectly. you need to be clear on your budget. 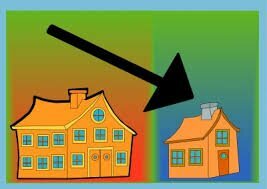 Often the aim of downsizing is to release some of the equity in your existing home. Decide at the outset what your maximum budget for your new property is and try to stick to it. you need to carefully review your belongings. Downsizing presents you with an opportunity to review critically how much “stuff” you really need. Is the baby grand piano a continuing necessity now that the only person that ever played it has headed off to university? Be realistic. Most people need things around them to which they have a sentimental attachment – the key is to have enough, but not too many, of such items. you need to decide on your preferred location – at the highest level this can mean whether you stay close to your existing circle of friends and acquaintances or take the plunge and make a fresh start in a new area. Having decided upon a particular area you then need to be more precise on where, within that area, suits you best. Remember, downsizing can sometimes be an opportunity to forget some of the factors that have driven your home location choice in the past – school catchment areas or proximity to a station for a daily commute – if this is the case you may find that your budget will go further than you thought. When you have properly, and as objectively as possible, considered each of the above elements you are then in a position to look at whether that leaves you with realistic options for a new home that ticks all the boxes. It will often be the case that it does not. If that is the case then the difficult task of prioritising will need to be undertaken. If your budget is fixed then you may need to consider revisiting the issues of location and/or possessions. If you are determined to stay in a particular area then budget and/or possessions will need to be reviewed. In an ideal world you will be able to find the exact size of property you want, for your budget and in your preferred area – if the world is less that ideal then be realistic about what is really important to you and try not to make too many compromises in that element of the equation.